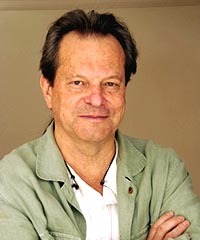 As a boy, Terry Gilliam read Mad Magazine, and in college he worked for a student publication called Fang. When he became Fang's editor, he remodeled the magazine in the image of Mad and started sending complimentary copies to Mad's Harvey Kurtzman. After graduation, Kurtzman offered Gilliam a job at Help!, a more adult descendent of Mad. Gilliam met John Cleese when the British comedian was touring New York, and Cleese briefly appeared in a photo shoot for Help!. Several years later, Help! went out of business and Gilliam worked in advertising and drew a comic strip for a surfing magazine. He eventually moved to Paris, where he worked as a cartoonist, and later to London, where he found no work at all until he called on Cleese for advice. With a recommendation from Cleese, Gilliam was hired as a writer for the British skit show Do Not Adjust Your Set, starring David Jason and featuring Eric Idle, Terry Jones, and Michael Palin in background roles. With his background in cartooning, Gilliam was soon given responsibility for creating animated sequences for the program. He had never done animation before, and he has said that he devised his unique bare-bones style simply because it was cheap and easy. When Do Not Adjust Your Set was cancelled, Gilliam joined Cleese, Idle, Jones, Palin, and Graham Chapman in creating Monty Python's Flying Circus for the BBC. Gilliam was the only American member of the otherwise-British troupe, and he was responsible for all the program's animated sequences. He has said that his castmates generally left him alone, offered no advice or interference, and that he had a free creative hand to animate whatever he could imagine. When he appeared in the flesh in Python sketches, he usually had thankless bits or wore drag. In his most memorable bit as an on-camera performer, he played Cardinal Fang in the "Spanish Inquisition" sketch. When the Python gang reunited to make Monty Python and the Holy Grail, Jones and Gilliam were chosen as co-directors. As a film director, Gilliam is now known for vivid adventures with political undertones and absurd special effects. Gilliam's films could not be mistaken for anyone else's work, and rarely tell the story audiences might expect. For instance: In Time Bandits with Sean Connery and Shelley Duvall, dwarves steal a map of all time and space from the Supreme Being. In The Fisher King, homeless Robin Williams falls for the lovely Amanda Plummer while commuters, nuns, sailors and Hassidic Jews dance in Grand Central Station. In Twelve Monkeys, future time travelers return to the modern day to research a plague that will kill 99% of humanity. In The Brothers Grimm with Matt Damon and Heath Ledger, the storytellers are re-imagined as con men. In Gilliam's most famous work, Brazil, Gilliam envisions a totalitarian society racked by terrorism, where an ordinary office worker seeks solace and strength from his own imagination. The film was released to good reviews in Europe, but sat on the shelf for months in America, as the studio insisted upon changing Gilliam's bleak ending. Gilliam of course refused, and nine months after the film opened in Europe, he bought an ad in Daily Variety, haranguing the chairman of Universal Studios with one simple question filling an entire page: "When are you going to release my film Brazil?" When the Los Angeles Film Critics Association gave the still-unreleased Brazil its award as Best Picture of the year, the studio relented and finally released a shortened version of the film that had played in Europe. Gilliam had the last laugh a few years later, when his "director's cut" was finally released in America, and became a perennial favorite at midnight shows and revival theaters. With the advent of home video, the film has found its audience, and it is frequently cited on critics' "Best Films Ever" lists. The Adventures of Baron Munchausen, based on the stories by R. E. Raspe, was plagued with cost overruns, and Gilliam's later attempt to film The Man Who Killed Don Quixote with Johnny Depp was cut short when horrendous weather and the leading actor's poor health made filming impossible. Most of Gilliam's films have been on time and on price, but with the squabbles behind the scenes on Brazil, Gilliam has a reputation as a 'difficult' director, and he has had numerous projects quashed in development. He admits to a cheerful response whenever a mainstream Hollywood action film does poorly at the box office. In 1975, ABC purchased rights to Monty Python's Flying Circus from BBC and began airing haphazardly re-edited "highlights" as part of the American network's late-night Wide World of Entertainment. In addition to inserting commercials and making cuts that fractured the continuity of the interconnected skits, Gilliam particularly objected to ABC repeatedly bleeping out such words such as "naughty bits", even though the program aired at midnight. Gilliam filed suit, and the case moved too slowly to stop ABC's butchery of the program, but the court ruled in Gilliam and Python's favor. In a landmark decision, the court decided that ABC's large-scale changes in the program constituted copyright infringement, and members of Monty Python regained the rights to the original series. The original episodes still air, but never edited and never with commercials. Gilliam's wife and children are British, and he became a British citizen in the 1970s, holding dual citizenship for decades. In 2006, though, Gilliam legally renounced his American citizenship, complaining that he does not object to having his estate taxed by England when he dies, since England is where he made his fame and fortune, but he does not want his wife and children's inheritance taxed by America "to build bombs, that's awful". Referring to the occupation of Iraq, Gilliam said he was "seriously considering suing George Bush, Cheney and the gang for making an illegal and unauthorized remake of Brazil."